Some of the miles you may talk to your hiking partner, some of the miles you remain quiet, observant to the world embracing you. And there are other miles when your mind not only wanders through a labyrinth of thoughts but climbs the steep hills of obsession, be it love or loss or laments. We hadn't planned to hike the Highline Trail in Glacier National Park this past summer. Instead, we had hoped to hike to Hidden Lake, the same hike that I had taken with my family when I was 11 years old. When we arrived at the visitors center, I texted my father and asked him if he knew the name of the trail that likely I remember more from the pictures in our scrapbook than from actually doing the hike long ago. He remembered Hidden Lake Trail, as well as the mountain goats and the snow patches and the picnic we had on a rock there. We got in line and asked the rangers about the trails, and were told that this trail was closed for the season due to grizzly activity. This seemed like an excellent reason to close a trail. It was my goal to carry my bear spray diligently in the side pocket of my backpack everywhere we hiked and never have to use it. 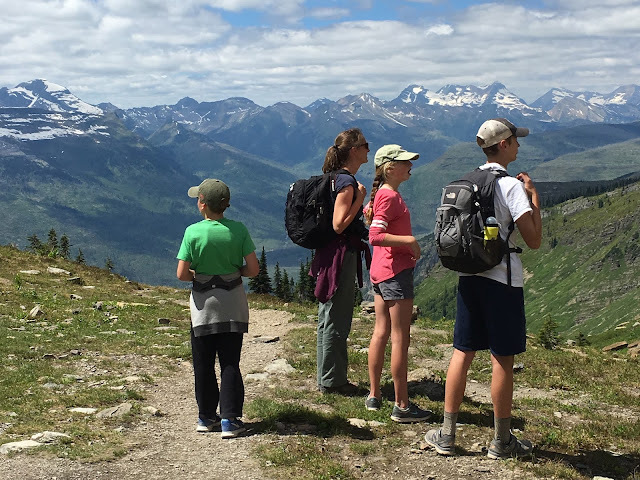 And so, I had done some research, asked the kids their opinions, and we had decided together that the Highline was worth attempting, despite parking difficulty at Logan Pass and the trail's 12 mile length and my dread of watching my children fearlessly walk beside deadly drop offs. We could always turn around if we needed to. We had plans for a decision point a certain distance in. At that point, we could head onward to the Granite Park Chalet and then descend the four miles to the park loop road where we could pick up a shuttle to ride back to our car. I had hopes for motivational treats that could be purchased at the chalet. Or we turn around at the decision point and head back to Logan Pass where we began. As we hiked, it was initially quite busy, but the farther we got from the Pass, the more enjoyably alone we were on the trail, many others turning back. We decided to head on. See the chalet in the center on the ridge line? We approached it for a good long time. The Granite Park Chalet was built in 1914 and 1915 by the Great Northern Railroad, as a part of a hut to hut trail system, attempting to attract tourists to the area looking for a similar system to those found in Europe at the time. The chalet is now a National Historic Landmark and still offers hikers backcountry lodging today. It was the last chalet built in Glacier and is one of two remaining chalets in the area. It wasn't until we left Glacier and headed to Yellowstone National Park that I discovered Terry Tempest Williams' The Hour of Land in the visitor's center there. In her then new book, she describes a hike she took on the Highline Trail with her family in 2003. Her goal the day of that hike was ours as well. Williams, back in 2003, planned to spend the night at the chalet and then head on up the Swiftcurrent Pass and over the Continental Divide, the beginning of a days long trek to the Sperry Chalet with her family. But Williams' chapter on Glacier National Park instead details her terrifying days spent at the chalet when the 2003 Trapper wildfire raged up the pass toward them and the efforts that her family and the rangers there made to save themselves and the chalet. If I had hiked the Highline knowing her story of being there in 2003, it would have changed the way I looked at the chalet and the landscape around it when we were there. I do have my pictures, and looking at them now, I understand better the landscape as we descended through the woods that burned that day, now slowly recovering 13 years later. I see the historic chalet in light of how it was almost lost, how a large group of people sat in a circle inside it and prepared for the worst. But I was struck by its beauty and remoteness even without that knowledge. I wondered how supplies were carried up to the chalet (and now understood why there was no ice cream offered), who got to stay in the guest rooms, and how it had been built 4 miles up a steep ascent. Looking at my pictures of the chalet's stonework, and of the rocks in the wildflower flourishing landslide areas approaching it, I see the same stones, the same colors reflected in the stone walls. Read Williams' book. There is an interesting story about the bathroom. And about the ranger's quick repair to the water supply so they could douse the chalet as the wildfire moved toward them. See the hidden water supply below? Williams' family threw the furniture off the porch and down the slope to remove anything burnable from near the stone walls. We didn't have to contend with any fires, but we did appreciate leaving the chalet carrying ice cold water purchased there; never has even ice cream tasted so delicious. We passed more of the rock used as building materials. But it was hot, and we were exhausted. And those last four miles down a steep trail on fatigued legs were the hardest of the hike actually. The descent, through the area burned by the 2003 wildfire, now recovering, growing back, new things, beautiful things, possibly due to the destruction, the loss. We had an amazing hike that day, and I knew even while we were doing it that it was something we were going to remember. And now, back at home, that landscape, that place, where you walk along a trail overlooking a vast protected area that has held many people, creatures, events, and stories, its meaning to us is still developing. Layering our story onto the history of the park, the complexities of the park's relationship with its first inhabitants, the stories of others who have been in the same landscape and experienced nature that cannot be controlled. That's the magic of national parks: the stories they hold of the relationships between people and the landscape. They can be told many ways, the same moments seen differently across time, with different perspective and information. Told across time within families, across generations, and between people and cultures connected through the land. I am so very happy to have my essay, from back here, published on Mamalode today. Mamalode's theme this month is growing up, and I can't think of a better description of our days and of my view of each of our children these days. My essay is about hiking the Highline Trail in Montana's Glacier National Park this past summer. This hike remains one of my favorite memories of our 3000 mile road trip from Maine to the American and Canadian Rockies and all the places in between this summer, and if you ask our children, they would agree. These days, when so much is unpredictable and unexpected, what I can count on is that if I propose we do something a little bit outside our comfort zone, with a little bit of difficulty and danger, I am likely to be met with enthusiasm. If undertaking such a thing results in a near disaster, all the better. The story that is spun from such an adventure retold again and again by all of us once we return home. As we hiked this 12 mile trail, I was taking pictures of the landscape, and of the trail, and of our children moving along it. We met quite a few people while doing so. Below, I have included some of my pictures from this hike. I look forward to writing more and sharing more about our time in Glacier and of our summer road trip in the future. For now, from home, the summer sun and warmth seeming as distant as Montana, here is a smattering of the view, from back here. I hope you will head on over to Mamalode and read my essay, and all of the other essays from this month's theme, growing up.